Gold possesses unparalleled qualities that have firmly established it as the symbol of power and wealth making it a source of continuous fascination by people the world over for more than 5,000 years. It's unmatched blend of exquisite beauty, utility, virtual indestructibility, portability and relative scarcity has captured the imagination of countless generations. It is this unique combination of innate characteristics that imbues gold with it's intrinsic value. Gold remains at the center stage in our modern world, serving concurrently as (1) a sovereign medium of exchange, (2) an essential industrial commodity, and (3) a mainstream safe haven investment vehicle. Your Interest in learning more about gold - It's history, characteristics, uses and especially its investment potential places you in the ranks of an expanding population of investors who have come to understand the value of adding a gold component to their portfolio - particularly since 9/11. These investors have seen how gold offers a balance that can help them achieve greater portfolio stability and better overall investment returns in these times of market volatility, geopolitical unrest and financial uncertainty. Gold has a long and well -documented history. Its gleaming origins date back to 3000 BC, when the Egyptians linked gold with their life-giving Sun God, Ra. Greek and Roman histories are replete with descriptions of gold as personal adornment, and as a symbol of elite social status and power. In 560 BC, King Croesus of Lydia struck the first gold coin, declaring it the "coin of the realm", thereby producing the first ever "legal tender" gold coin to be used as a medium of exchange to facilitate commerce. In the centuries since, as nations nations developed their economies and international commerce evolved, gold assumed a dominant role as the preeminent global currency of choice. National mints the world over produced a plethora of gold coins, which rapidly became the foundation for most domestic and international trade. In fact, most federal governments still hold significant amounts of gold in their treasuries to ensure their financial viability. Similarly, many of today's knowledgeable investors now own gold, as they understand that gold coins and bullion bars are highly-liquid, tangible assets that have inherent value. In fact, they are the only exchange-traded assets that are not outside entity's liability such as stocks and bonds. Consequently, these investors recognize gold as the consummate safe haven investment and ultimate medium of exchange. When economic conditions deteriorate or a sudden unexpected geopolitical event impacts global stability, the media often describes the resultant jump in the price of gold as reflecting a "flight to safety". This is no journalistic flight of fancy. Investors know that even if companies, currencies or countries fall, gold's intrinsic value, it's universal appeal and liquidity as a medium of exchange, will endure. As a result, in times of political instability and economic uncertainty, astute investors seek gold - as a hedge and as portfolio insurance. In turn, the price of gold tends to rise. One of the most interesting aspects of gold ownership is that its price commonly moves counter to stock and bond prices. Recent history bears this out. In the three weeks following the U.S. stock market crash of October 1987, while the Dow Jones Industrial Average fell by nearly 30%, gold prices rose almost 4%. During Wall Street's "high tech" boom in the 1990's, the price of gold languished in the $250-$300 per ounce range, only to soar by more than 275% to over $700 per ounce in the six years following the terrorist attacks of 9/11. Gold's tendency to counter the stock market makes it an ideal for portfolio diversification, as it enhances the stability of one's total investment portfolio. In fact, studies have shown that adding gold to one's investments can actually increase overall returns over the long term. 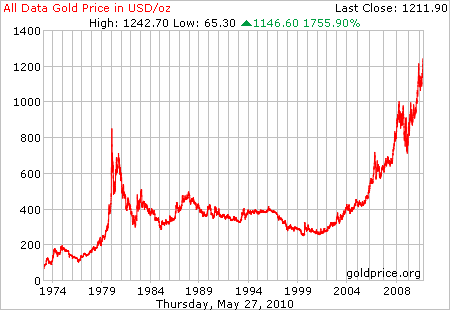 During the last century, the gold price was fixed by international agreement at $35 per ounce for almost five decades. Then in 1975, it was allowed to begin floating freely with natural market forces. As the proceeding charts show, after the constraints were lifted the price of gold had some wild swings but still maintained a value well above its former fixed price. In 2009 the market value of an ounce of gold surpassed $1000 for the first time. What is driving this price increase? In addition to surging worldwide demand and faltering world economies, the trillions of dollars of U.S. governmental debt are also buoying gold's market value. The laws of supply and demand have also impacted gold. According to the World Gold Council research, the world's gold supply from all sources amounted to 4,025 metric tons in 2005, but declined by 12% to 3,541 metric tons in 2006. At the same time, investment demand rose by some 25% spurred primarily by the growing popularity and availability of gold-backed Exchange Traded Funds (ETFs). The end of the 21st century's first decade has seen gold fluctuate from $600 to $1000 per ounce. Experts forecast that widespread fear over global financial and geopolitical uncertainty will continue driving the demand for physical gold in its investment product form to record levels for the foreseeable future. Physical gold comes in many forms and sizes. 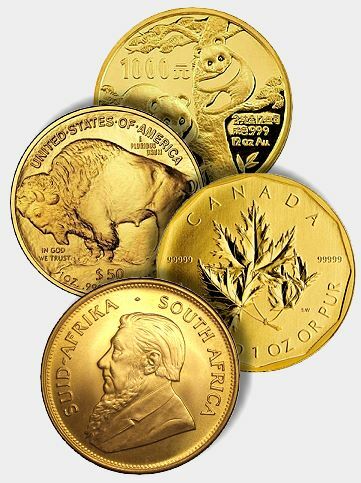 Lets explore the most popular ways to buy and own gold bullion. 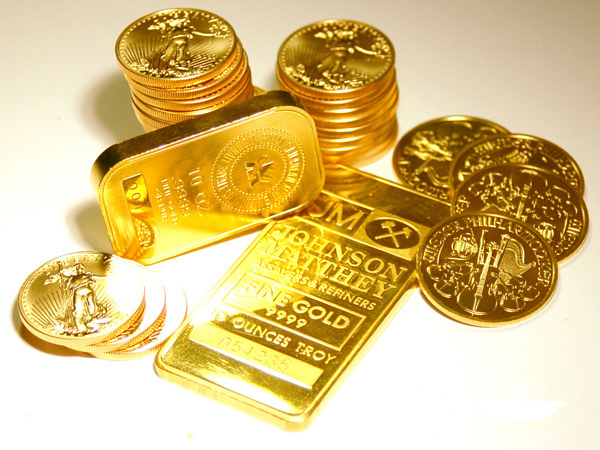 Gold can be purchased in the form of either bars or coins. Here are some of the differences between the two and the most frequently asked questions about owning gold.